He was never asked to preach there again. This coming weekend, an Imam will preach there. He will not be delivering a pre-worship talk on Islam or presenting a post-worship discourse on interfaith reconciliation, either of which would be perfectly acceptable in a university church of theological scholarship and missional service. No, he will be preaching the University Sermon at the 10.30am Choral Eucharist. Now, Imam Monawar Hussain MBE DL might be a perfectly pleasant and congenial chap: he is certainly distinguished and learned. The Oxford Foundation, which he established, does some manifestly sterling work in the promotion of religious and racial harmony and good relations between persons of different faiths and racial groups. And Imam Monawar Hussain would doubtless be welcomed at any church to talk about peace and love and reconciliation and understanding. But preaching the sermon at a Eucharist? Imam Monawar Hussain, being a Muslim of orthodox belief, does not believe in the divinity of Jesus: Isa, as the Lord is called in the Qur’an, is not the Son of God, nor was he crucified at Calvary. But Isa is not the Lord, for the Jesus of the Qur’an did not die on a cross, and neither was he resurrected. Yes, he was born to the virgin Mary; yes, he worked miracles; yes, he preached in Judæa and had disciples. But the Jesus in whom Imam Monawar Hussain believes is not the Jesus of the Bible, for he believes the al-Injīl (the Gospel) to have been corrupted. In Islam, Jesus is a nabī (prophet) and rasūl (messenger) of God. He is abd-Allāh (a servant of God), wadjih (worthy of esteem), and mubārak (blessed). But for Imam Monawar Hussain, Jesus did not die on a cross, he did not lie in a grave, and was not resurrected on the third day. Imam Monawar Hussain believes in another Jesus (2Cor 11:4). 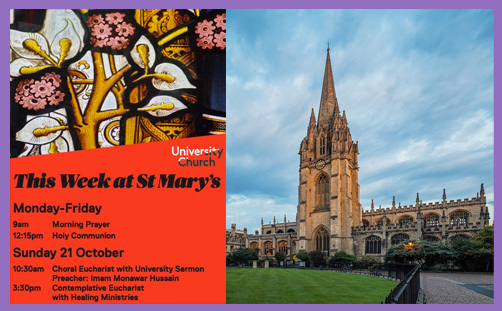 Preaching the University Sermon on Sunday, Imam Monawar Hussain will deny by his presence in the pulpit the very body and blood of Christ commemorated by the Eucharist; he will refute by his mere being: “God from God, Light from Light, of one very substance with the Father…”. Being an eminent theologian and respected scholar, sensitive to spiritual contention and mindful of the need for multi-faith fraternity, he is not likely to use the occasion to proclaim Mohammed in the succession of prophets (as happened at Westminster Abbey); or to deny the divinity of Christ (as happened at St Mary’s Cathedral, Glasgow). He will no doubt be preaching about love, peace, reconciliation and tolerance, all of which would be laudable topics for an inter-faith lecture or post-worship meditation. But by inviting an imam to preach not just a sermon, but a Eucharistic sermon, it is hard to understand how this glorifies the crucified Son of God; how it honours those martyrs who died renouncing theological error and deception; and how it respects a sacred act of divine worship which is supposed to be conducted according to the rites and formularies of the Church of England. Perhaps the Rev’d Dr William Lamb, Vicar of the University Church, might help us to understand? Failing that, perhaps the Rt Rev’d Dr Steven Croft, Bishop of Oxford, might confirm that his pulpits are now open to people of all faiths and none, and that we can look forward to a series of heretics, blasphemers, idolaters and unbelievers training his congregations up to be wise unto damnation, being emptied of the Holy Ghost, and devoid of the fruits of the Spirit. And no, there is absolutely no expectation at all that an invitation to preach will ever wind its way to Cranmer’s Tower.